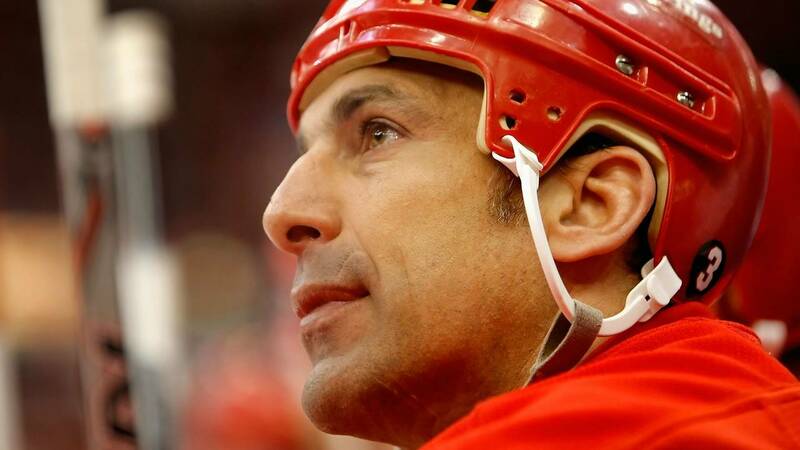 DETROIT - Hall of Fame defenseman Chris Chelios is officially leaving the Detroit Red Wings organization. Chelios joined the franchise as a player in 1999. Over the course of 10 seasons he helped Detroit win two Stanley Cup championships -- 2002 and 2008. He left the Red Wings in 2009 and played seven games with the Atlanta Thrashers before retiring at the age of 48. Since then he has held an advisory and assistant coaching role with Detroit. Now he's leaving Detroit to go home to Chicago, where he grew up and spent nearly a decade playing for the Blackhawks. "I would like to thank everyone in the Red Wings organization, starting with the Ilitch family – Mrs. Ilitch, Chris Ilitch, and, of course, the late Mr. I. There’s a reason the Red Wings are so revered around the National Hockey League and it starts at the top with ownership. The Ilitch family’s dedication and passion for both the Red Wings and the city of Detroit is second-to-none. I would also like to personally thank Ken Holland for everything he has done for me. I’ve learned so much from him, both as a player and during my time on the management side. Ken is a world-class general manager and he’s an even better friend and mentor. I have no doubt the Red Wings will be Stanley Cup contenders again in the near future. I’ve thoroughly enjoyed being a part of the Red Wings organization over the last 19 years. Admittedly, I was skeptical about the 1999 trade that brought me to Detroit. As a Chicago guy who was playing for the Blackhawks at the time, we despised those Detroit teams of the 1990’s. After the trade, however, things changed quickly and I began to feel right at home. What an unbelievable experience, playing on some of the greatest teams in league history, with some of the greatest players of all-time. I consider myself extremely lucky to have been a part of it all. The Cup-winning teams in 2002 and 2008 are the obvious highlights, but I’m grateful for every chance I had to put on a Red Wings sweater. For me, this is an opportunity to move back to Chicago to be closer to family, and in particular my mother. I began to seriously consider moving home last February after the passing of my father. Now that my children have all graduated, it seems like the ideal time for my wife, Tracee, and I to make the move. Chelios was inducted into the Hockey Hall of Fame in 2013. His career spanned three decades. It began with the Montreal Canadiens way back in 1983. He helped the Habs win the Stanley Cup in 1986. He was traded to the Blackhawks in 1990. With Chelios on the blueline, the Blackhawks became a perennial Cup contender but never could go all the away. They began to fade in the late 90s. Meanwhile, in his years with the Blackhawks, Chelios became a hated rival for Red Wings fans who came to know him as a pest and instigator on the ice. Both Chicago and Detroit fans were stunned on March 23, 1999 when the Red Wings traded Anders Eriksson and two first-round draft picks to the Blackhawks in exchange for 37-year-old Chelios. He quickly went from public enemy No. 1 in Detroit to one of the most beloved Red Wings. While in Detroit, Chelios entrenched himself in the community with several restaurants including Cheli's Chili Bar. Overall, Chelios played 1,651 games in the NHL, scoring 185 goals and 763 assists. He was named to the NHL All-Star squad 11 times. At the international level, Chelios won a silver medal with the United States at the 2002 Winter Olympics in Salt Lake City. He won a gold medal with the United States at the 1996 World Cup of Hockey. He also coached Team USA in the 2016 World Junior Ice Hockey Championships.